Two chardonnays tasted over the weekend rather dispelled the myth about the grape variety being over promoted and, as a result, contemptible in many people’s eyes. Firstly, Tanners Macon Chardonnay Clos de la Crochette 2008 (£19.50). It was a bright, clear, lemon-yellow and attractive to look at. The nose was rich with honey and pineapple notes – much more interesting than the usual lemony tones. Light in the mouth, the wine was dry but the acidity balanced a slight raisiny sweet finish – a real rich mouthful of wine. You could call this layered – an over-used term, I know – but however you describe it, the wine was delightful to drink. Now the second chardonnay – tasted blind. So it’s the slow reveal. The colour was golden (age?) and really clear and bright (good quality?). On the nose, it was complex, with slight honeyed notes and fine acidity. The richness suggested a well-made white wine, probably chardonnay because of the firmness in structure. The palate was gloriously silky-smooth, dry, well-made, rich with balanced acidity. It had a ‘fat’ quality rather than a lean style but there was a ‘tingling seam of acidity’ (Richard). This wine gave much pleasure without the accompanying food. Beautiful. 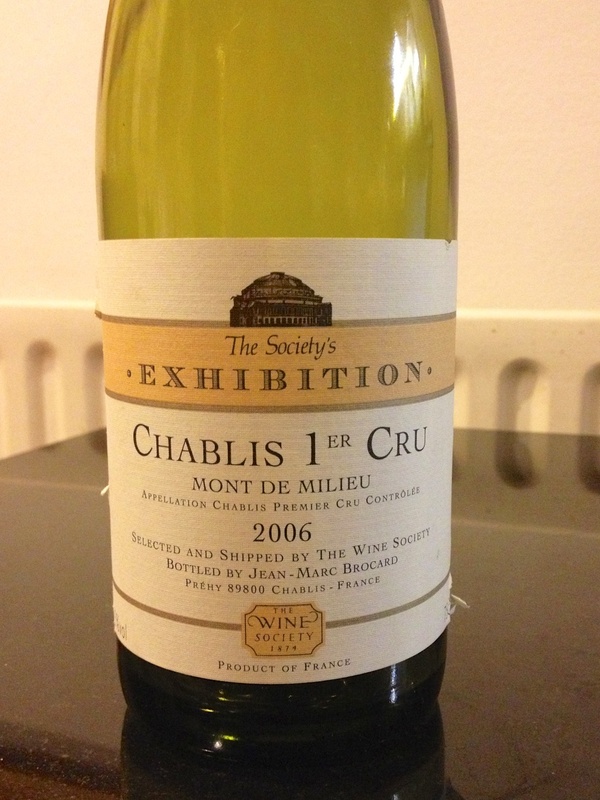 I plumped for a Cote de Beaune white but in fact it was a ….. Wine Society Exhibition Chablis Mont de Milieu 2006 (Brocard). There, it was a weekend of two chardonnays – neither boring. We’re looking forward to more. Equipo Navazos have already featured on this blog. They are a sherry negociant who source older (and often forgotten) wines from bodegas, mostly around Jerez. They are also involved in producing wines of ‘quality and character’ of which this is one. The name refers to Darwin, not Descartes. 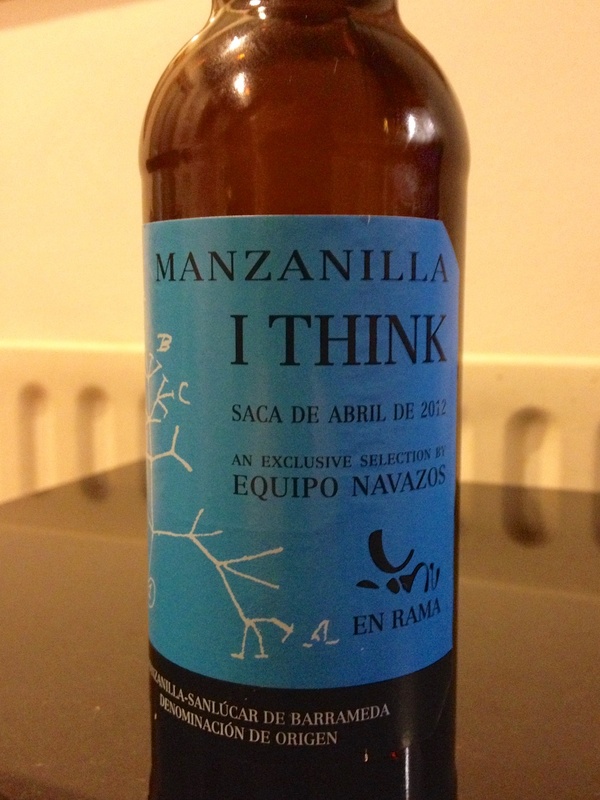 This manzanilla was withdrawn from barrel in 2012 at about four years old, and, it is claimed, should continue to develop for several years. This is rather counterintuitive as we are always told to enjoy manzanilla young so I think this will develop into a ‘pasada’ (aged) style. On the nose it is pungent, burnt toffee, the taste is powerful, long, dry and refreshing. Very slightly hazy as little filtration was used. 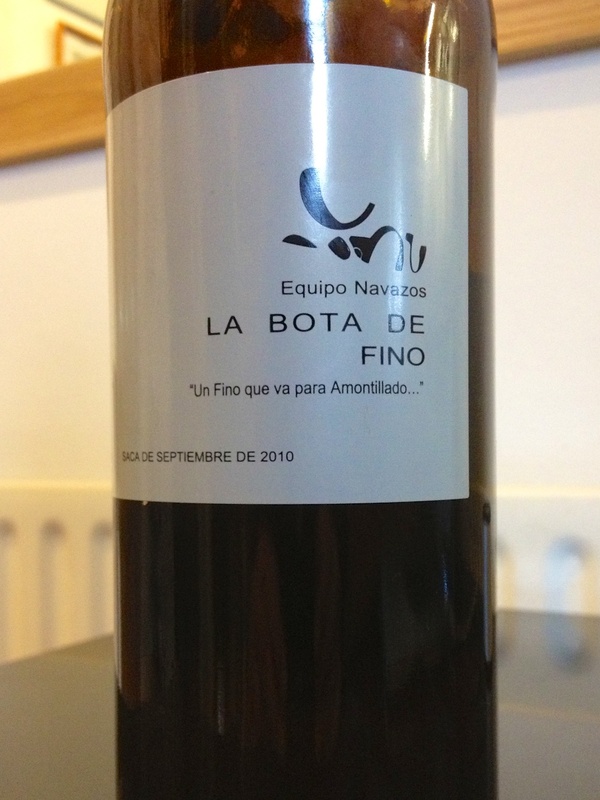 Rather similar to the Waitrose Fino del Puerto, if that is a useful reference. This came from the Little Wine Company who have some other Equipo Navazos bottlings in stock. This famous wine reminds me of the 60s pop groups your friends said you should like but you never quite got – but pretended you did. 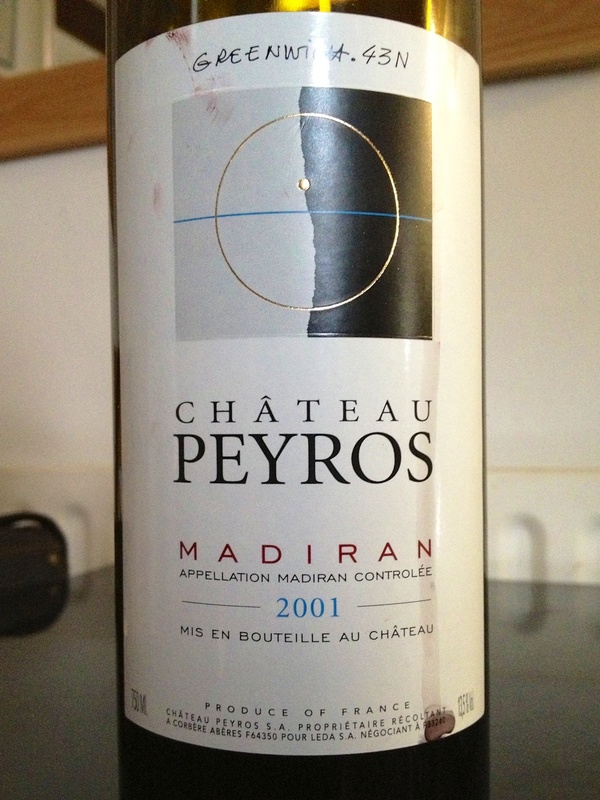 Or the deep classic literature (Ulysses or any Dostoevsky) that you ought to enjoy but …..
Chateau Peyrol 2001 Madiran is made with 95% Tannat. (Is that the only palindromic grape variety?). The colour was black-red, it was opaque and rather dull to look at. On the nose you could mistake it for a young claret (some Cab. in there?) with its green sappy nose and muted spice. To taste it was big, lacking in fruit and not very giving, with little sweetness; it seemed very closed. We respected rather than liked it. Definitely a food wine and the food would need to be very strong-flavoured. We thought it would be better decanted (six months ahead?) but Richard said it had not softened much a day later. Not the best wine experience I’ve had but at least I’ve tried it. Now, where’s the Brothers Karamazov book – I should enjoy that. Please excuse the dreadful pun in the title. You see, Claire and I visited Stratford to see the play with a title very similar to the one above. Whilst Claire shopped I .. errr … shopped and found Vin Neuf, (what a great name! ), an independent wine merchant. 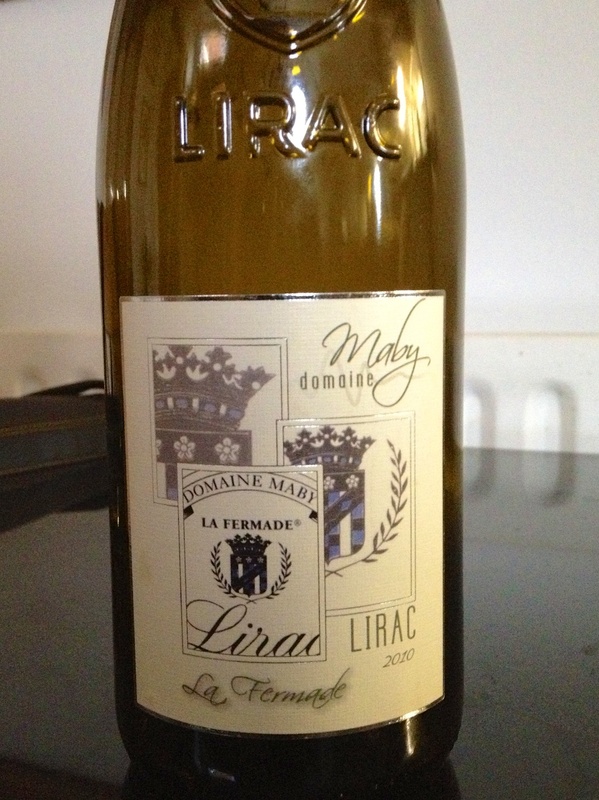 James Richards was very welcoming and suggested I tried a white Lirac La Fermande Domaine Maby 2010 (the WS sell the red from the same producer). The blend is Grenache, Clairette, Viognier and Picpoule and costs about £12. It presented a pale, lemon yellow colour with very slight green lights and some viscosity (alc. at 14%). Richard immediately exclaimed “fennel!” on the nose and he was right. This was wedded to a refreshing high note of acidity. The palate was weighty, full and rich with a smooth back-palate that was dry. 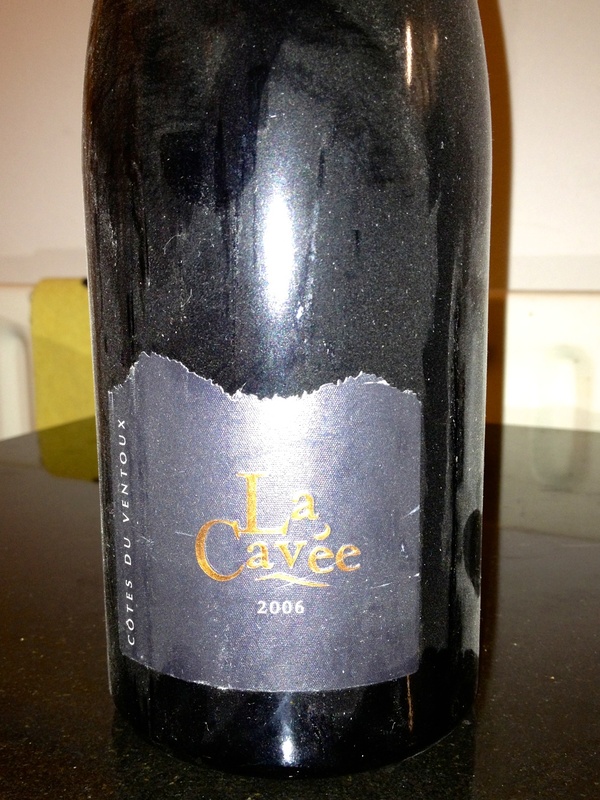 This is great food wine – we drank it with a brandade of salt cod, thanks R.- when the food is full flavoured. It could be even better if decanted. There might be some words to follow on he decanting of white wine. This was really enjoyable, thanks James. Next play is – As You Like It. Now that’s a great title for a wine blog. In 2010 Trevor (my father-in-law) and I drove down to Villes-sur-Auzon for a short holiday. Villes is a charming French village east of Carpentras with fine views of Mt. Ventoux. The village has a co-op and this wine came from there, about €10. This is their ‘prestige’ wine – designer label and really heavy bottle. ‘Caver’ is a regional word meaning to dig for truffles. A 50-50 mixture of Grenache and Syrah from old vines, with 30% of the wine spending 10 months in new barrels. I couldn’t detect much tannin though. On the nose the wine had the typical Ventoux ‘jammy’ aroma, which I don’t much like. However the taste was different, even atypical, being rich and deep with quite a lot of damson like fruit. An easy wine to drink (13.5%), even without food and pretty good for a cooperative. Sherry – but not quite. We tried, with delicious Spanish ham, a fortified wine from the Montilla-Moriles DO, an area well inland and about 200k north-east from Jerez. It used to be well-known for providing a cheaper alternative to sherry. This wine was a generoso (fortified wine) [see comment below] from a well-known producer called Perez Barquero. Named La Bota de Fino it had 15.6% of alcohol; we drank it cool but not cold. 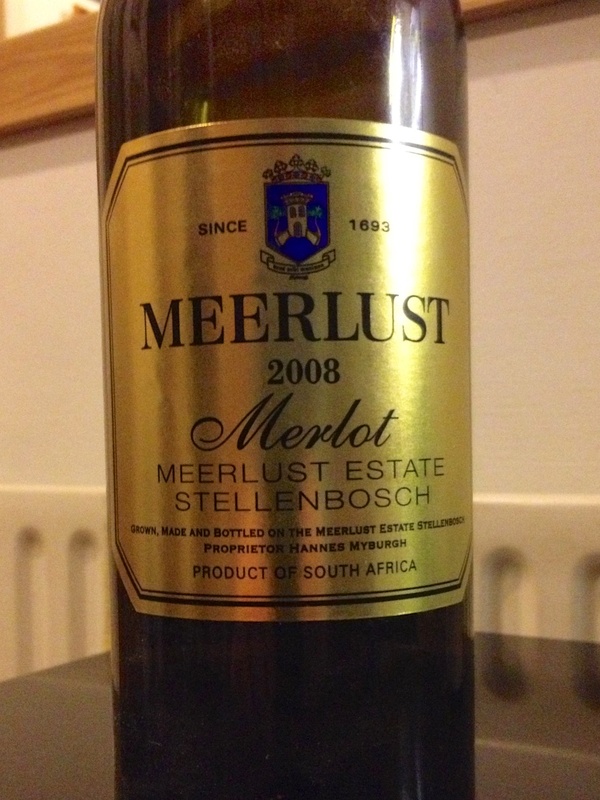 The name ‘Meerlust’ means ‘love of the sea’ and is applied to the farm at the centre of this old estate. Sea breezes cool its well-established (1693) vineyards which are still owned by the Myburgh family – the eighteenth generation – although individual wine makers have put their own stamp on the various vintages. With all that history behind it we expected a half-decent wine – and we weren’t disappointed. Supplier – Majestic, price £16.99 for two or more.